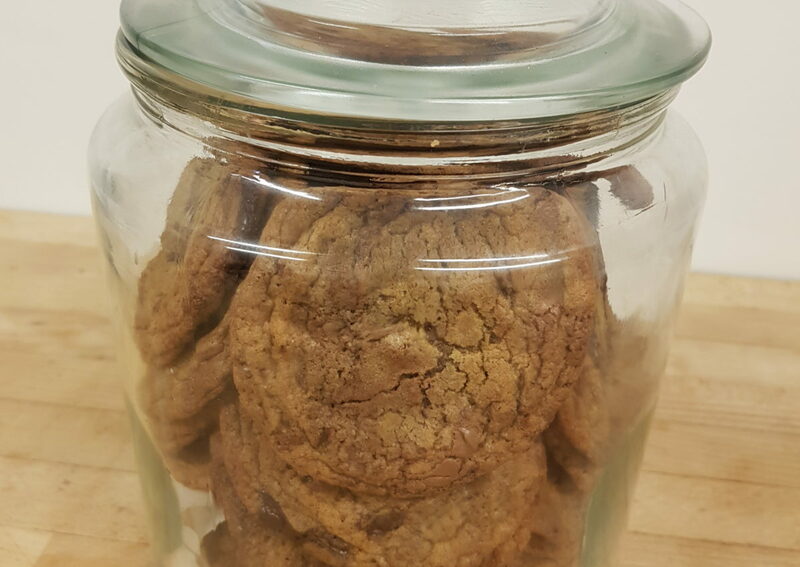 So here is the recipe for chocolate chip brownie cookies from Two Peas and their Pod. You don’t need a happy mistake brownie to make these. Use your favourite brownie recipe or if you don’t have time to cook brownies from scratch use shop bought ones. Happy baking. Using an electric mixer, cream butter and sugars together for about 3 minutes. Add in the eggs and vanilla and mix until combined. With the mixer on low, slowly add in the dry ingredients. Stir in the brownie chunks and chocolate chips. Put cookie dough mixture in the fridge for 30 minutes to ‘set’ slightly. Weigh out 40-45g of cookie dough mixture and form into balls. Place eight to nine cookies on each of the prepared baking sheets, about 5cm apart. They can spread quite a lot. Bake cookies for 10-12 minutes or until the edges are slightly golden brown. When baked, remove from oven and let cookies cool on the baking sheet for 2-3 minutes. The cookies will keep in an airtight container for 3-4 days. 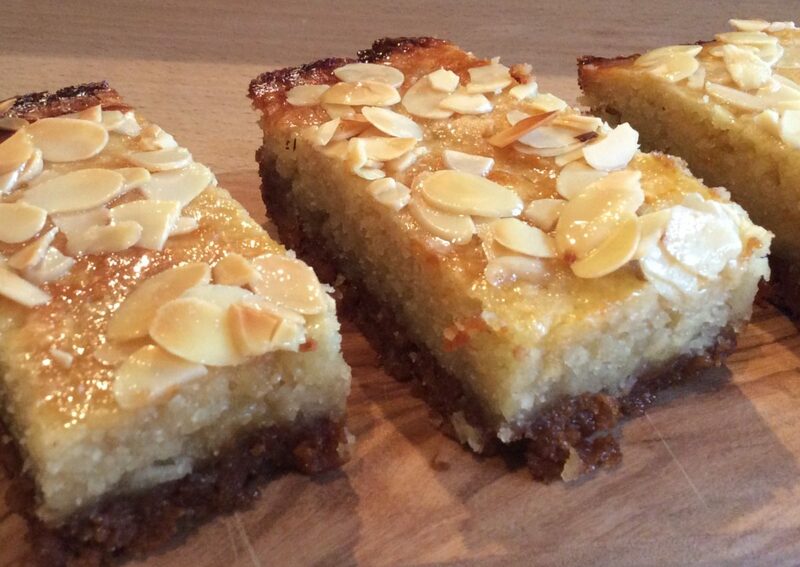 The other day, I was sent a photo of a ginger, almond and lemon slice which my owner’s wife had seen at a cafe in the departure lounge of an Australian airport. I asked her if she had the recipe or the name of the cafe so that I could try to make the slice. She answered no to both. So, over the last couple of days, I have been trying to looked at various recipes to see whether I can come up with a similar slice. No recipe that I could find was the perfect combination of ginger, almond and lemon, so I decided to combine a couple of recipes (Scrummy Lane’s recipe for lemon Bakewell slices adapted from a BBC Good Food recipe and Lynwood & Co’s lemon curd recipe). My first attempt required some tweaking, but here is a recipe, which I feel provides a wonderful combination of ginger, almond lemon flavours. Blend Ginger Nut biscuits in food processor. When finely blended, add the tsp ground ginger and unsalted butter and blend together. Press into the base of a line d 20 x 20cm baking tin to create an even layer. Bake the biscuit base for 10 minutes and then allow to cool. Heat lemon, sugar and butter over a bain-marie. Whisk the eggs and then add to the mixture. Cook until it thickens (coats the back of a wooden spoon). Allow to cool. Beat together the butter, sugar and lemon zest in the bowl of an electric mixer until creamy. Gradually add the eggs and the ground almonds. Stir in any remaining ground almonds and flour. Squeeze juice from two lemons into a small pan. Add icing sugar and heat over a medium heat until the icing sugar is melted and the mixture becomes syrupy. Spread the lemon curd over the ginger nut base. Try not to go too close to the edges to stop the lemon curd sticking to the baking paper. Top with the almond filling and smooth over with a spatula. Scatter the almond filling with flaked almonds . Bake for 20 minute at 180C until the top is lightly golden. When baked, prick the top of the cake all over with a cake tester or wooden toothpick and spoon syrup over the top of the cake, ensuring an even distribution of syrup. Allow the cake to cool. When cool, cut into 8-10 slices.